The accuracy of a particular prediction will vary depending on how long before the start of the season it was generated. Generally, the closer to the start of the hurricane season a prediction is produced, the higher its accuracy will be. For example, a prediction issued in August will have, in general, higher accuracy than a prediction issued in April. Below, the real-time skill of seasonal forecast schemes used by different forecasters for over one decade is shown. Forecasts displayed here are issued by the Colorado State University (CSU), the National Oceanic and Atmospheric Administration (NOAA) and Tropical Storm Risk (TSR). The period compared in this analysis is 2003-2015, which is a time period when all three forecast agencies were utilizing relatively similar techniques for issuing these predictions. Note that we only include forecasting groups that have issued seasonal predictions for at least 10 years in order to have a fair representation of the skill level associated with each forecasting technique. 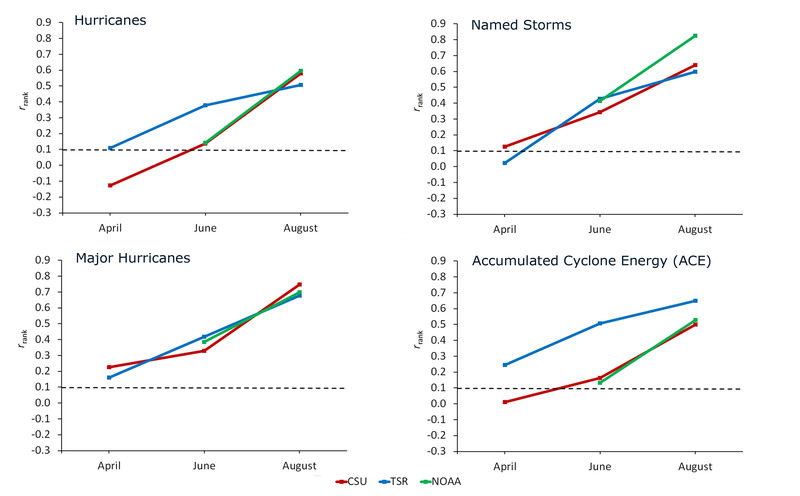 Rank correlations for three different forecasting agencies related to four different parameters: accumulated cyclone energy, major hurricanes, hurricanes and named storms. Note that the skill of the models applied by each of the agencies improves as the peak of the Atlantic hurricane season approaches. The Tropical Storm Risk group shows the best real-time from 2003-2015 for accumulated cyclone energy. XL Catlin and any affiliate company, the Barcelona Supercomputing Center and Colorado State University shall not be liable to any user for any loss or damage, whether in contract, tort (including negligence), breach of statutory duty or otherwise, even if foreseeable, arising under or in connection with use of, or inability to use, the website; or use of, or reliance on, any content displayed on the website. See more in Liability statement.